Kernel methods (see for example (Shawe-Taylor and Cristianini, 2004)) are a powerful class of algorithms for pattern analysis that, exploiting the so called kernel functions, can operate in an implicit high-dimensional feature space without explicitly computing the coordinates of the data in that space. Most of the existing machine learning platforms provide kernel methods that operate only on vectorial data. On the contrary, KeLP has the fundamental advantage that there is no restriction on a specific data structure, and kernels directly operating on vectors, sequences, trees, graphs, or other structured data can be defined. Furthermore, another appealing characteristic of KeLP is that complex kernels can be created by composing and combining simpler kernels. This allows to create richer similarity metrics in which different information from different Representations can be simultaneously exploited. DirectKernel: in computing the kernel similarity it operates directly on a specific Representation that it automatically extracts from the Examples to be compared. For instance, KeLP implements LinearKernel on Vector representations, and SubTreeKernel (Vishwanathan and Smola, 2002) (the SubSet Tree Kernel is a.k.a. 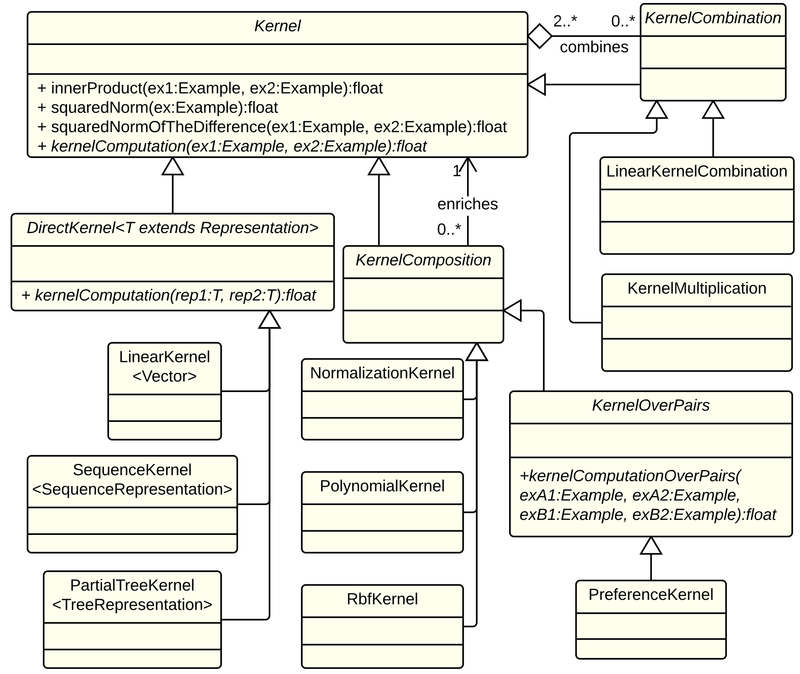 Syntactic Kernel), and PartialTreeKernel (Moschitti, 2006) on TreeRepresentations. Finally, the class KernelOnPairs models kernels operating on ExamplePairs, which are pairs of objects, e.g., pairs of texts as in (Filice et al., 2015). It can be also used to design a ranking algorithm based on the preference kernel (Shen and Joshi, 2003), using the implementation PreferenceKernel. S.V.N. Vishwanathan and A.J. Smola. Fast kernels on strings and trees. In Proceedings of Neural Information Processing Systems, 2002.